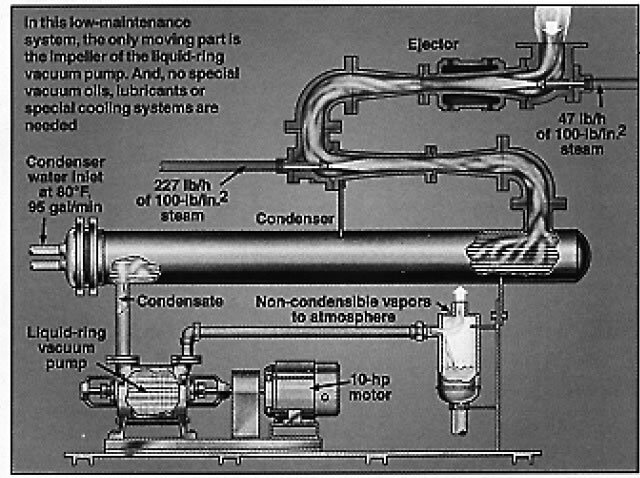 A Croll Reynolds Rotajector vacuum system, consisting of two steam ejectors operating in series and followed by a surface condenser that condenses steam from the ejectors and a liquid-ring vacuum pump (to discharge non-condensable vapors to atmosphere), helped Kalama Chemical, Inc. (Kalama, Wash.) achieve the 10 Torr or less vacuum required for distillation separations in the manufacture of a new floral fragrance – amyl cinnamic aldehyde. The system, completely pre-assembled by Croll Reynolds, was delivered to Kalama as a completely piped, skid-mounted unit. The system’s only moving part – the impeller of the liquid ring vacuum pump — makes no metal-to-metal contact with the casing. Within five years of the Kalama installation of the Rotajector system in it’s amyl cinnamic aldehyde line, the firm installed two additional Rotajector systems for other flavor and fragrance products.